I hope you all had a steamy lovey weekend filled with v-day celebrations. I did. I mean, I picked out some old Harlequin romances from my bookcase (yes, I have a select few) and read them and loved their trashiness. Les sigh. I was telling my mister about it and well, we giggled. They are rather fun! I mean, its really awesome when you already have the whole thing figured out from the beginning, the books always follow the same story line and they have as little depth as possible. I have to say, its wonderful when the goods are delivered. And you can definitely judge Harlequins by their cover. Ha ha! Onto other pressing matters, I guess. I'm flattered to have made it thus far in Project Sewn. Seriously. It's been pretty intense what with the workload I already have going, but I am determined to give it my all. That said.... this week's challenge was shoes. Here's the thing though. I have to preface this by telling you that this outfit wasn't actually made for the challenge. The outfit itself was actually based around these leopard heels, but I made this stuff way back in September and never blogged about them because of the hours I've been keeping for the last few months. And we can't have that, now can we? 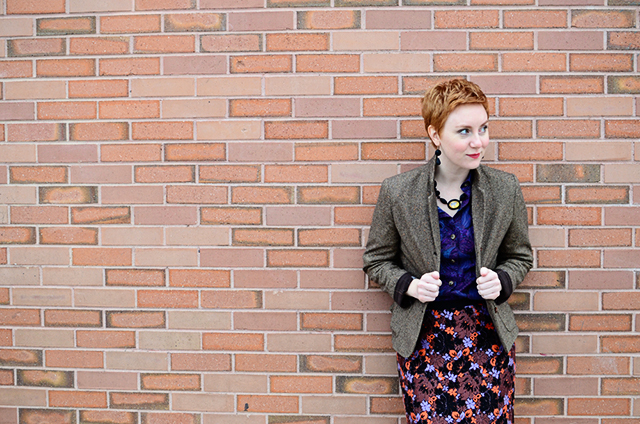 I mean, I never blogged this skirt! How dare I?!! Alas, this week was one of those where my inner worker bee finally said ENOUGH! and I couldn't bring myself to crank out anything from my sewing machine and I barely kept up at work. Taking a break has been much needed and so, it was Harlequins, Deep Space Nine and me-time as I slowly turned into a pumpkin all week. Still, the outfit bears some pretty remarkable elements and I'm proud to say that I can finagle my way out of tight situations with finesse (thank goodness I had sense in September to feel that I needed to make this for Project Sewn). So let's talk. You can see that I didn't deviate from my jacket obsession. My oh my. This jacket, as you already know if you read me, is not me-made. But since I had to re-line this thing (it being my favorite jacket ever) and since re-lining a jacket isn't exactly the easiest thing ever, I included it in this week's challenge. I've done this with several jackets that I already have actually. I'm all about making a garment last as long as it possibly can and this jacket is definitely no different. This is the original jacket from challenge #1 - my green jacket there being an exact replica of this one. My love for this thing knows no bounds. It will survive! 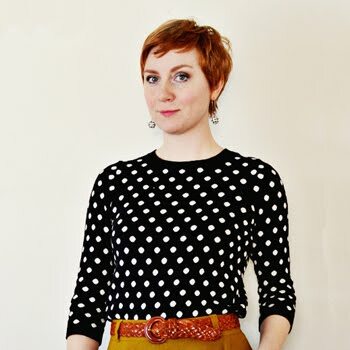 My button-up is Simplicity 2339 (out of print, boooo!) and it's a go-to pattern for me. Though I'm getting ready to give the famed Archer a try. I love me a good button up, especially when one can move their arms freely. You know me. I have that problem with sooooooooooooo many things. I even get tired of re-iterating the same fitting problem over and over. (Note to self: grow smaller upper back to accommodate patterns more easily). My top's made from a Liberty of London cotton lawn. What else? This shirt, I have to say, was impeccably made. I'm singing my own praises just a little bit, but really, it's really really good. You would never even know that I made it. I am very proud of myself on that front. I used all the tricks that I've gathered from everywhere and it bears some real fine workmanship. The skirt is my own self drafted skirt. It's made of a lace that I seriously splurged on because I'm not really a lace kind of gal and when I see one that I like, I die and like, have to have it! The lace was incredibly expensive ($80/yard - YIKES). I underlined with a 4-ply silk crepe, lined the skirt in bemberg rayon lining and finished it off with a petersham ribbon waistband. It's pretty much gorgeous. Pretty much. This brings me to another find that I'm hesitant to tell you about because this online shop boasts some pretty remarkable fabrics and I am loathe to give up my secret sources because then it means that y'all will go out and buy all the fabric. I go there when I'm in the mood for something ..... different. Fabrics and Trimmings on Etsy has really lovely fabric. A lot of what they have is novelty apparel and I have to say, very very tasteful and well, sooooooooo cool. Oh I can't even believe I'm telling you about them, but I have to. You'll love the stuff you find there and you know, it's important that we keep these little resources going. So go and shop with impunity. It's where I found this lace that was worth every single cent. And I made sure that I went on over there before I posted this and bought up all the good stuff anyway...... You know, I tease. right? Right? (wink, wink) Now, enough of my silliness. Project Sewn awaits your vote! Such a cute couple! I almost used that Liberty of London fabric for my trench coat but couldn't afford that many yards! I love the classic jacket! Makes me want to head to the fabric shop to buy wool. Cute pic of you and your man! You two are so cute together! :) Yet another fabulous ensemble from you! You ladies are knocking it out of the park- I'm having so much fun every week seeing your makes!!! Very cute picture of you and your love together! Whoa, Sunni, you really did it up this time. I mean, you alway do, but for round 3 of PS, you went above all your previous makes. 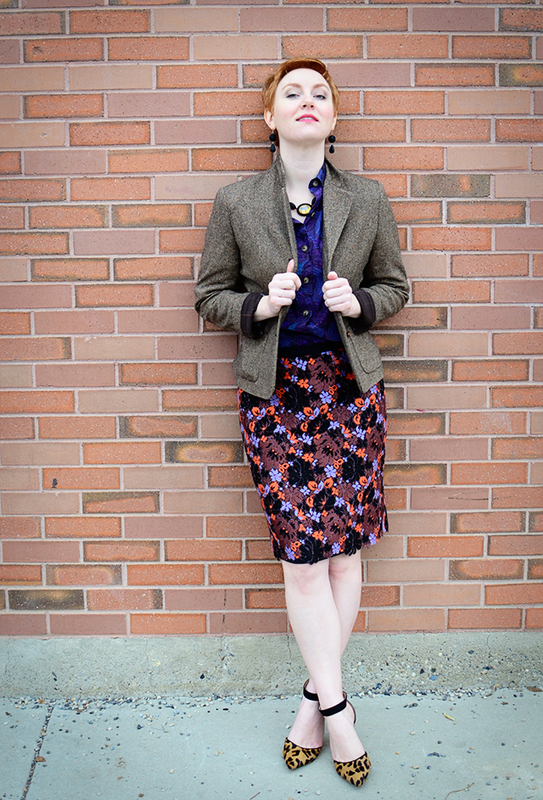 This outfit contains all my favorite fabrics - lace, 4 ply silk, and ridiculously printed cotton. Wow, your entire outfit is awesome! I love mixing and matching colours and prints. We can wear black to a funeral, amirite? 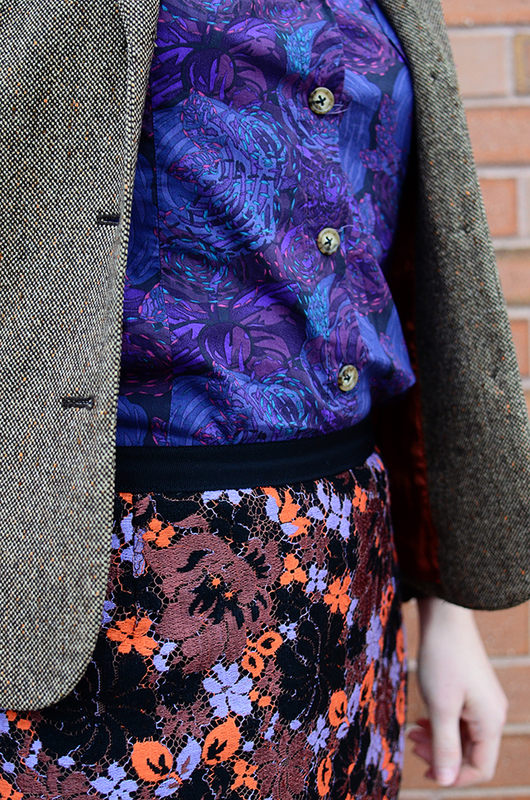 I think my favourite is that skirt, what fantastic fabric/colour/print/lace. ALL so pretty. wowza!!! love this outfit! the skirt is absolutely to die for... what a perfect splurge! Those shoes! I've said it before and I'll say it again, your style is amazing! Absolutely love this look, I think it's my favourite of yours so far! Bravo!! Ah you two are too cute :) You really do have a sense of style and as Coco said, "fashion fades only style remains" nice work. Aww, you guys are so cute! Love all the elements of your outfit! Your jackets are super inspiring! Love this ensemble! Your pairing of fabric & texture is delightful. Good Luck in the contest!